In position fixing navigation, a position fix (PF) or simply a fix is a position derived from measuring in relation to external reference points. 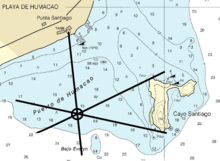 In nautical applications, the term is generally used with manual or visual techniques such as the use of intersecting visual or radio position lines rather than the use of more automated and accurate electronic methods such as GPS; in aviation, use of electronic navigation aids is more common. A visual fix can be made by using any sighting device with a bearing indicator. Two or more objects of known position are sighted, and the bearings recorded. Bearing lines are then plotted on a chart through the locations of the sighted items. The intersection of these lines is the current position of the vessel. Usually, a fix is where two or more position lines intersect at any given time. If three position lines can be obtained, the resulting "cocked hat", where the three lines do not intersect at the same point, but create a triangle, gives the navigator an indication of the accuracy. The most accurate fixes occur when the position lines are at right angles to each other. Fixes are a necessary part of navigation by dead reckoning because dead reckoning relies on estimates of speed and course. The fix confirms the actual position during a journey. The fix itself can introduce inaccuracies if the reference point is not correctly identified or is inaccurately measured. This cartography or mapping term article is a stub. You can help Wikipedia by expanding it.